I was ashamed to find out the other day that it has been nearly two years since I last posted anything on here so thought I had better start doing some updates and give our lone contributor of late (Mick) some support. Unlike some I have no plans to de-camp to the now commercially owned Warners Group RMweb. The standard of moderation there continues to be less than impartial and piss-poor in my opinion. There are plenty of good people on there and some excellent modelling of course, but I'm happy enough to stay 'local' and blog here. Not much actual modelling has taken place over the past 18 months whilst the house has been subject to major alteration and improvement. 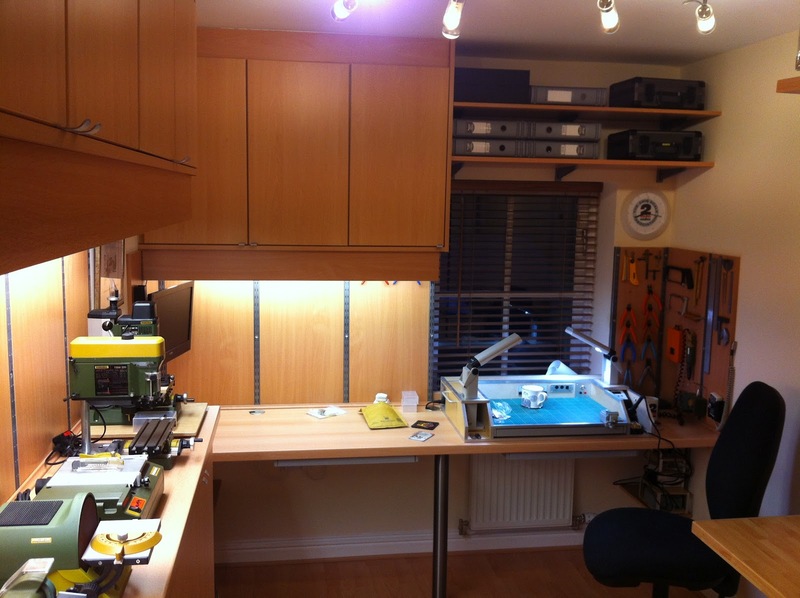 About 5 years ago I blogged about my then new little workshop in a large broom cupboard under the stairs. Well that has now been handed back to the domestic authority and is now full of freezer, beer/wine cooler, vacuum cleaner and other assorted household paraphernalia. I am now resident in what was the smallest bedroom before we converted the loft and the family all moved up a room size. 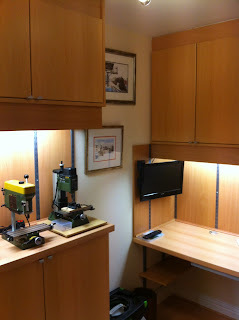 I've fitted the room out myself, the cabinets were custom made for me to oddball sizes by a good customer from work. Those 2mil wallclocks don't half tick loudly! I will try and do a seperate posting on the workstation soon. Machine shelf with cupboards under and over. I've been building up a selection of Proxxon kit for a few years now and its nice to be able to keep them all out at once. At the far end is my new Warco 'big' mini lathe which with MT3 headstock and MT2 tailstock gives me much more capacity and flexibility than my old Toyo derived micro lathe. 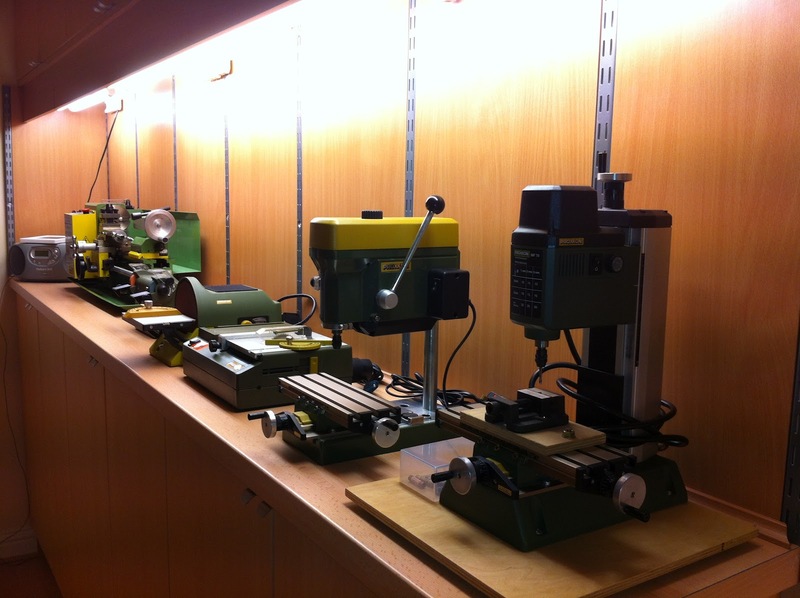 The shelf puts the machines at a comfortable height for operation whilst standing. View into the left corner. The TV/DVD combo was bought cheaply on offer from Asda and is used to play my collection of railway DVD's as I model! I've also started to load kit instructions onto my iPhone as PDF's and can punch them through onto the screen via a little AppleTV gadget. The shelf seen under the workbench is to stand my airbrush compressor on. The pictures are prints of some of Mike Raithby's excellent work, often used on the cover of December 2mm Mags. 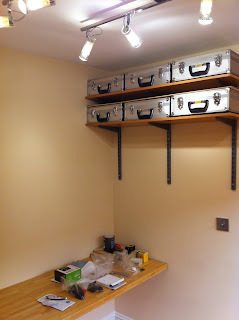 View into the opposite corner with stock boxes up on the shelves. 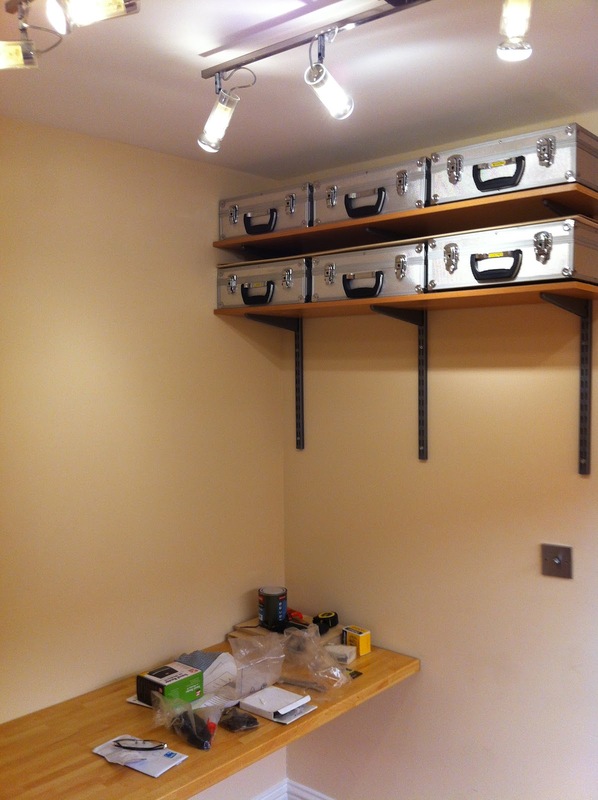 The work bench along the wall here is a folding one and can be dropped out of the way when I need to free up space to work on a layout module. The brackets are very heavy duty and the whole thing is rock solid when up. I can work on one 1200mm layout module at a time with access to all four sides. 'Niddbeck Bridge' at 1500mm also fits but access is only from three sides. I suppose I am now running out of excuses for not getting any modelling done! I have dusted off the boards for my 'Haromthwaite' micro layout and am looking at restarting that soon. The other major decision I need to make is wether I should restart work on the 7200mm of 'Pool in Wharfedale' or do another small 1500mm layout to utilise the expensive flight case I had made for 'Niddbeck Bridge'. Both schemes have their attractions and otherwise. Nice bits of kit. Showed the Shop 1 groupie but was told I have to leave mine in the shed. Shop 1 has now relocated both the small and large bed lathes and the milling machine into the conservatory. Great light for these fading eyes, and with the under-floor electric heating I installed at great expense and sore knees it will still be fine for the winter. Looks a lot better than plants I can tell you! Very impressive, Edward. I presume the lathe is the Warco Mini Lathe (Item 4820/4800). There are lot of lathes of this size choose from and I'm looking to buy one myself in the near future for similar sized work in 009 - how did you make your selection? (I presume it wasn't because it was the same colour scheme as the Proxxon kit! ).